23 cm 570 p. : col. ill. Connections and clashes between new and old media, as told by interviewees ranging from the founder of Twitter to the publisher of the New York Times. Mainstream media, often known simply as MSM, have not yet disappeared in a digital takeover of the media landscape. But the long-dominant MSM-television, radio, newspapers, magazines, and books-have had to respond to emergent digital media. Newspapers have interactive Web sites; television broadcasts over the Internet; books are published in both electronic and print editions. 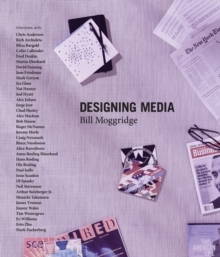 In Designing Media, design guru Bill Moggridge examines connections and conflicts between old and new media, describing how the MSM have changed and how new patterns of media consumption are emerging. We learn about innovations in media that rely on contributions from a crowd (or a community), as told by Wikipedia's Jimmy Wales and Craigslist's Craig Newmark; how the band OK Go built a following using YouTube; how real-time connections between dispatchers and couriers inspired Twitter; how a BusinessWeek blog became a quarterly printed supplement to the magazine; and how e-readers have evolved from Rocket eBook to QUE. Ira Glass compares the intimacy of radio to that of the Internet; the producer of PBS's Frontline supports the program's investigative journalism by putting documentation of its findings online; and the developers of Google's Trendalyzer software describe its beginnings as animations that accompanied lectures about social and economic development in rural Africa. At the end of each chapter, Moggridge comments on the implications for designing media. Designing Media is illustrated with hundreds of images, with color throughout. A DVD accompanying the book includes excerpts from all of the interviews, and the material can be browsed at www.designing-media.com.